The plan promotes efficient energy consumption and savings, and is being supported as part of a larger chunk of funding to support clean-energy projects in B.C. First Nations. B.C. 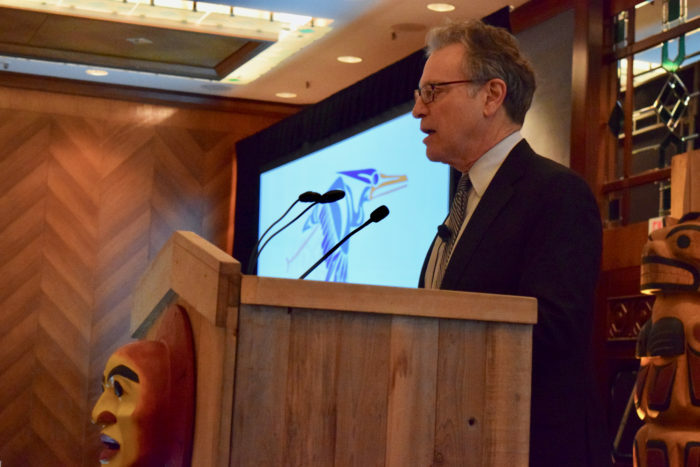 Minister of Environment and Climate Change George Heyman spoke of the initiative at Naut’sa mawt Tribal Council’s Indigenous Green Economy Conference on March 13. Funding for Homalco’s project is being supported by the B.C. First Nations Clean Energy Business Fund, which funded nearly $2.5 million for Indigenous-driven projects in 2018. “Today, the Ministry of Indigenous Relations and Reconciliation is announcing (14) Indigenous-driven projects,” he said. The projects bring funded include a solar farm at Tsilhqot’in, the construction of a biomass conversion site at West Moberly and the construction of a hydropower plant to reduce diesel use at Hesquiaht. At Homalco, the funding is allowing the nation to implement a community energy plan that was completed in 2018. Chief Darren Blaney said the initiative will include energy audits for community buildings and homes, implementing energy efficiencies in community spaces, and making recommendations to members about reducing their energy consumption. This will include initiatives like applying weather stripping and insulation in buildings and installing low-energy light bulbs and appliances. “Homalco has been interested in becoming a more energy-efficient community and reducing energy costs for our community members,” Blaney said in a statement. The nation will work with Naut’sa mawt Tribal Council to create efficiency standards throughout the community and to investigate energy consumption. Homalco will also identify community “champions” to lead the way as the plan is implemented. The First Nations Clean Energy Business Fund also invested $100,000 towards Naut’sa mawt Tribal Council’s Indigenous Green Economy Conference in Vancouver on March 13 and 14. According to the province, applications for the next First Nations Clean Energy Business Fund intake will be accepted until the end of May.